Deploying to Windows Azure is very easy from Git. I use the Azure Cross-Platform Command Line (open source on github, written in node) that I get from npm via "npm install azure-cli --g" to make the sites. And the tool will not only make the site, but also add a git remote for you, something like https://username@MyFirstSite.scm.azurewebsites.net:443/MyFirstSite.git. When you push to that git remote, Azure deploys the site. You can git push sites with PHP, node, ASP.NET, and Python. When you push a folder with code to Azure via Git, unless you're pushing binaries, Azure is going to compile the whole thing for you when it gets pushed. It will restore npm modules or restore NuGet packages, and then build and deploy your app. However, in lieu of a .deployment file, you can also set an application configuration setting with the Azure Portal to to the same thing. 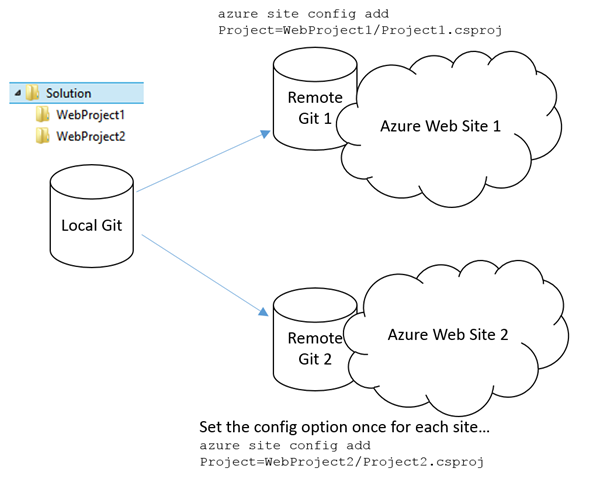 What's nice about setting the "Project" setting via site configuration rather than via a .deployment file is that you can now push the same git repository containing two different web sites to two remote Azure web sites. Each Azure website should have a different project setting and will end up deploying the two different sites. I have a number of solutions with two or more web sites, or in one case, a web site I want separate from my web api, and I deploy them just like this. Sponsor: Big Thanks to Aspose for sponsoring the blog this week! Aspose.Total for .NET has all the APIs you need to create, manipulate and convert Microsoft Office documents and a host of other file formats in your applications. Curious? Start a free trial today. Nice article...Typically a website will rely on a database of some sort behind it, is there any support for synchronising schema changes with a database project as well? Does the deployment have to reference a .csproj or could it reference a directory? Reason I'm asking: for our nodejs projects we dont have csprojs, but we do have a /deploy dir that contains all the min-ed css/js (a la yeoman). Currently we copy the /deploy dir out of our "source git" to another dir that has an "azure-only git" and deploy from there. Being able to just set a directory would be pretty amazing. The deployment is customizable. By default it just does the build and copy and such to put your site live, but you can provide a custom deployment script to do more than that. From my own experimentation, the deployment script is sandboxed and has some limits in what it can do. For instance, if you had some sort of wacky idea about using a combination of PhantomJS, Selenium, and CassiniDev, you're going to get errors when Cassini attempts to grab a port. I'm not sure if it will have network access to execute database or other resource upgrades, but now I'm curious and might have to try it myself. In terms of git, are you using git hub, git on visual studio online or something else (like hosting yourself)? I was wondering if you can do some kind of SQL Azure Encryption post. I would like to encrypt some data on a SQL Database (Azure) in order to be compliant with the PCI standard. You may know of a link perhaps where I can see this information. (If you used .net 4+ MVC it would be even better). Thanks. I used this to answer a SO question. Also, I've been wondering the same thing so thanks for that, too. Thanks Scott! Should the same apply for Git repositories on VS Online? Any plans to include Ruby deployments from Git? We'd like to migrate our RoR apps off Heroku at some point.